Last week I blogged my first set of examples from RIAUnleashed. Today I thought I’d share a few more. Specifically - these examples are both HTML/jQuery based and do not make use of Flex at all. 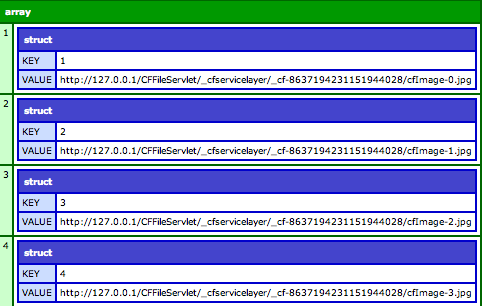 The first thing I thought I’d point out is that you don’t need to use the CFaaS CFCs as webservices. The documentation seems to imply this. However, when I tested CFaaS with simple HTTP requests, everything worked fine. I guess I shouldn’t be surprised but again, the docs had led me to believe otherwise. 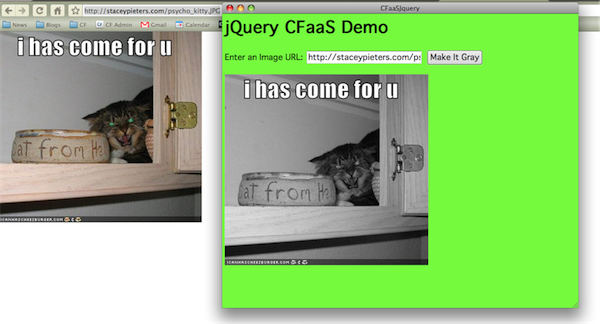 I worked up a few simple demos, but here is one that demonstrates one way you could use CFaaS in a non-Flex context. As you can see, I simply bind to the doit button. When run, I execute a getJSON against a ColdFusion server, passing in all the information the method needs to work. All in all - pretty fun to write. I’m still not sure where I’d use CFaaS yet in production, but the more I dig into it, the more impressed I get. Having trouble with too many map markers and CFMAP?